Sihanoukville is considered as a “heaven on the earth” with stunning beaches and many islands which still preserve its own beauty. If you are planning to visit this amazing city, here are some useful tips for you. Located in the heart of the city, it is home to many hotels, hostels, restaurants, travel companies and bustling foreigner’s quarter. Here offers you a lot of things to relax like cinemas, bars, shops,… at the reasonable prices. Not far from Ochheuteal is Otres beach with many small fishing villages creating the tranquil scenery for tourists to visit. Wonderful beach with white sand and blue water will be an ideal place to sunbathing and swimming. It belongs to the luxurious Sokha Beach Resort – the first 5-star beach resort in Cambodia. The resort features bungalows overlooking the sea and romantic lodges built on the sand. Sokha beach is the best place for couples and families enjoy summer vacation. Next to Sokha Beach is Independence Beach. The famous Independence hotel is located on the north of the beach. The beach is very clean, suitable for you to soak yourself under the sunlight. Situated in the North, quite far from the city center, Victoria is considered as the best spot to watch the sunset in Sihanoukville. The beach has a range of bars and hostels overlooking the sea. 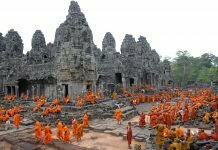 It also is familiar address of backpackers who like to discover the new things. The best time to travel Sihanoukville is dry season, from the end of November to early of February when the weather is cool and the sunlight is not too harsh. The period from the early July to late October often has heavy rain while from March to June, the weather is quite hot and humid so there are not many tourists coming here. 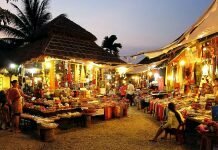 Sihanoukville offers a lot of places to stay, including a 5-star resort on Sokha Beach, several 3-star hotels and many budget motels. 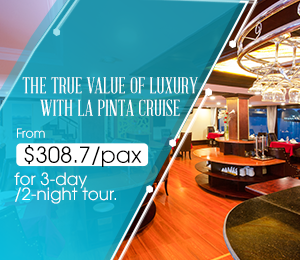 There are many options for your choice, ranging from $2 to $3,000 per night. Of course, the more money you have to pay, the better services you receive. Getting to Sihanoukville, besides swimming and adventure travel, visitors should not miss to enjoy delicious seafood. All the beaches have bars and restaurants serving foods and drinks for you. Just have to pay 3-5 USD, you can enjoy a fresh seafood plate and a glass of Angkor beer. Koh Russei: also known as Bamboo island, is the island surrounded by fine punk sand and dense forests. Travelers can do snorkeling or just take a walk in the jungle or go to some of the unexplored beaches on other side of the Island. 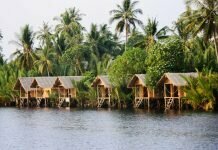 Koh Rong: With white sand beaches, blue water, Koh Rong is considered as a tropical paradise and one of the most beautiful islands in the Gulf of Thailand. Koh Rong has just developed in tourism so it still preserves its own beauty. There are no road on the island, the main mean of transportation is boat. Koh Rong Saloem: Cambodian often call it is “lazy island” because once you set foot on the island, you will not want to do anything but relax. Diving and snorkeling to see beautiful coral reefs are the most exciting on Koh Rong Saloem island. Koh Tang: It takes a few hours to get there from Sihanoukville beach. Although tourism on the island is developing quickly, it still keeps its pristine beauty. 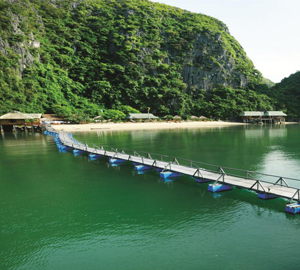 Koh Pos: or Snake Island, just takes 10 minutes to get the island from the mainland by boat. It is a luxury tourist destination, developed by Russian investors. The island is connected to the mainland by a bridge built in July 2011 but vehicles are not allowed to pass through.